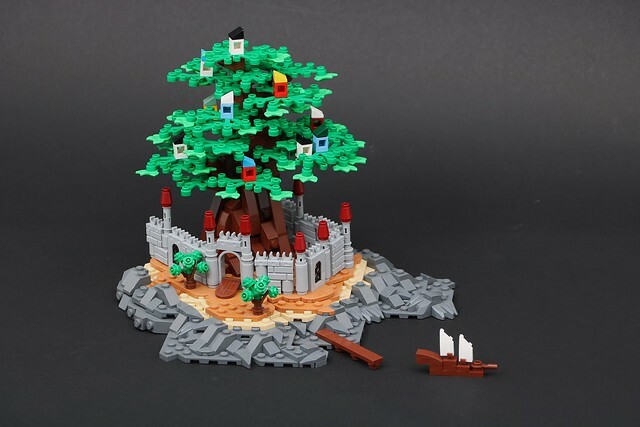 This delightful microscale castle makes me think of what the Ewoks would be like if they had progressed to a medieval period in development. The microscale castle and surrounding landscape is well executed, and the sails on the boat using the newish 29119 is an excellent part choice. The towering tree filled with tree houses adds a uniqueness to the scene that really drew me in wanting to know so much more about the story in John Klapheke's head for the people in this tree. Are they elves? Lilliputians who moved to the trees and need the walls to defend from squirrels? One thing is sure the archers in the tree are going to have quite some range defending this castle.